The Iveragh Peninsula / Uíbh Ráthach is located in County Kerry, Ireland. It is the biggest peninsula of Southwestern Ireland. 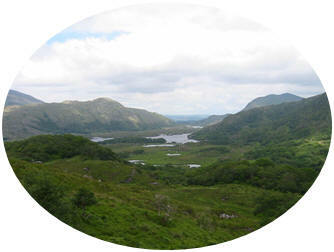 A mountain range, the Macgillycuddy's Reeks, lies in the centre of the peninsula. Carrauntoohil, its highest mountain, is also the highest peak of Ireland. Tadhg (Tim) O'Crowley had a business in Cork (T. Crowley and Son, 10 Merchants Quay, Cork, Erie) and he published a music book entitled "Crowley's collection of music for the Highland or Irish Bagpipes, compiled and arranged by Tadhg O'Crowley" which was released in 1940. He published another book "How to play the Uilleann Pipes" in 1936. He was a maker of Irish Uilleann pipes. These instruments are highy regarded today and frequently mentioned alongside of Kennedy and Rowsome Uilleann Pipes. The business closed in 1960 with Kennedy buying up the tools and stock.